I sometimes wonder about setting up a “climate hypocrite of the month” award. Chris Rapley, who earlier this year published a report stressing the importance of establishing a dialogue with the public, yet has recently being sending audiences to sleep with a droning monologue at the Royal Court Theatre. Stephan Lewandowsky, who accuses climate sceptics of being conspiracy theorists, yet wrote an article claiming that there is a “subterranean war on science“. Naomi Klein, who has been flying around the world on a tour to sell copies of her book on the twin evils of fossil fuel emissions and capitalism. ATTP, for criticising people for commenting on things they haven’t read, as well as for saying that people are only welcome at sceptic blogs if they agree with the blog owner (he has banned most people who don’t agree with him from his blog). Paul Nurse, who wrote “We need to be aware of those who mix up science, based on evidence and rationality, with politics and ideology, where opinion, rhetoric and tradition hold more sway”. But he himself is a socialist and supporter of activism, and introduced the recent Royal Society report, full of opinion and rhetoric yet devoid of science. Rahmstorf claims the graph is ‘deceptive’ because it plots monthly data. Perhaps he thinks throwing data away is a good idea. Perhaps he prefers the decadally averaged graph that Thomas Stocker and the IPCC are so keen on, that hides the warming slowdown so effectively. Rahmstorf also says “One needs to scale the CO2 data correctly for an honest comparison with temperature, so that it can actually be used to evaluate climate scientists’ predictions of the CO2 effect.” Shub points out on twitter that this is circular reasoning – the graph has to scaled “correctly” to make it fit with Rahmstorf’s predetermined conclusion. Another deceptive claim by Rahmstorf is that the data shown was “from several km up in the troposphere”. In fact the TLT data is strongly weighted to the near-surface atmosphere, with a peak in the weight function at about 2 km, so “several km” is misleading. 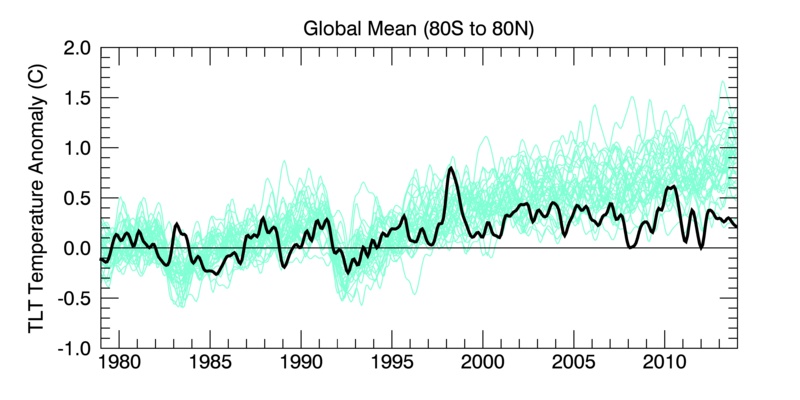 Notice how the blue line appears to continue upward while the data itself shows the well known pause in warming. Rahmstorf has been producing this sort of deceptive graph for years, since at least 2007, in papers and in a report for the Copenhagen conference in 2009, see Lucia’s “Fishy Odor” and “Source of fishy odor confirmed” posts from 2009. In that case, Rahmstorf extended the smoothing interval from that used in a previous paper, but did not change the description in the caption. What he had actually done had to be reverse engineered by the climate bloggers. “Rahmsmoothing” has also been discussed several times at Climate Audit. Another obvious deceptive aspect of Rahmstorf’s graph is the horizontal green line labelled “Preindustrial Level”, creating the impression that in “preindustrial” times the global average temperature was unchanging. And there’s another nice comment from Steve Harris at RealClimate. 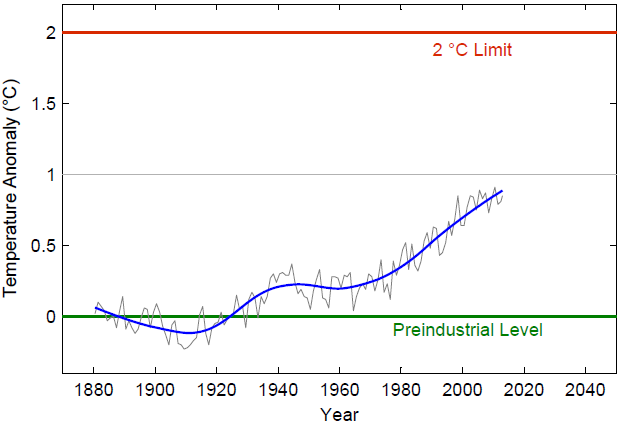 Shub has a blogpost on the Realclimate effect. The terrifying news is reported by the WMO, Carbon Brief, and of course the BBC, who seem to think that the extra 0.01C will lead to an increase of cars rusting in ponds. The Independent says that the 0.01C of warming has got the daffodils confused, while Paul Hudson says at his BBC blog that climate sceptics are “feeling the heat”.